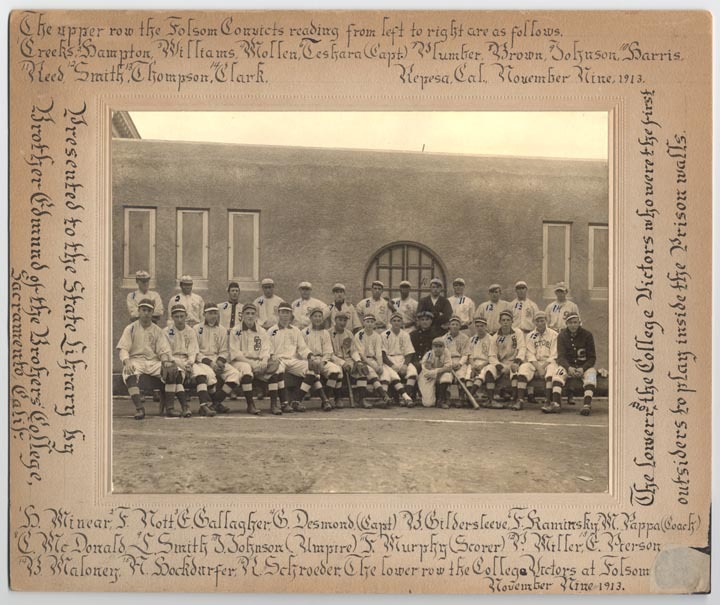 Folsom State Prison started hosting amateur baseball games around 1913, although prior to this, the inmates participated in ball games during the annual July 4th Folsom Field Day that began in 1904. Amateur teams around California even came by for a game. Every weekend and every holiday the teams played; something the convicts—both players and spectators—looked forward to. Prison staff were also enthusiastic about this entertaining break in monotony. Captain of the Guard, P.J. Cochrane said of Folsom’s team in 1921: “I’d like to put this bunch of rock breakers up against that San Quentin nine. And I don’t think any of them would try to ‘break’ going over and back to do it, either,” he added proudly. Categories: Folsom History | Tags: early prison baseball, Folsom prison baseball, Folsom prison history, prison baseball | Permalink.